Nintendo has shown off an upcoming new character for their fighting game, Arms. Joining the roster in the upcoming update is Lola Pop, an inflatable clown character whose unique style and character remains true to fighting game’s quirks. Along side the character’s release, three more new Arms, as well as, a new stage will be released during the next free update. Adding on to the news, players who have yet to be convinced that Arms is a fantastic game can take part in another Test-Punch, which is going to be held this weekend. The Test-Punch will run from Friday, 25 August 2017 at 0800hrs PT (25 August 2017 2300hrs SGT, 26 August 2017 0000hrs JPT) to Sunday, 27 August 2017 at 1400hrs PT (28 August 2017 0500hrs SGT, 0600hrs JPT). To participate, all you have to do is to download the Test-Punch from the Nintendo Switch eShop and be online at the designated time. 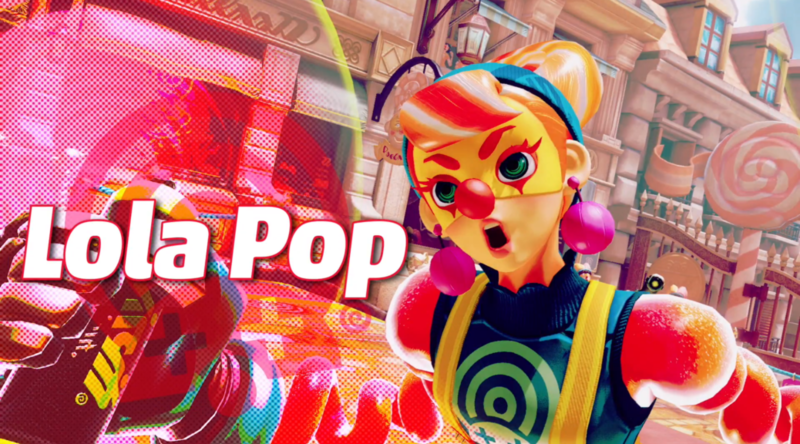 Fans of Nintendo Switch fighter game ARMS will soon have a new character to use as part of the next free update: street performing pugilist Lola Pop. A well-traveled clown with a personality as colorful as her clothing, Lola Pop’s key ability is inflating her body like a balloon, providing her with great defensive qualities. With three new Arms and a new stage, players can look forward to developing new strategies whether competing locally against friends or taking on the world online. Lola Pop will be coming to ARMS for the Nintendo Switch in the next free update. No news at the moment as to when that will be.